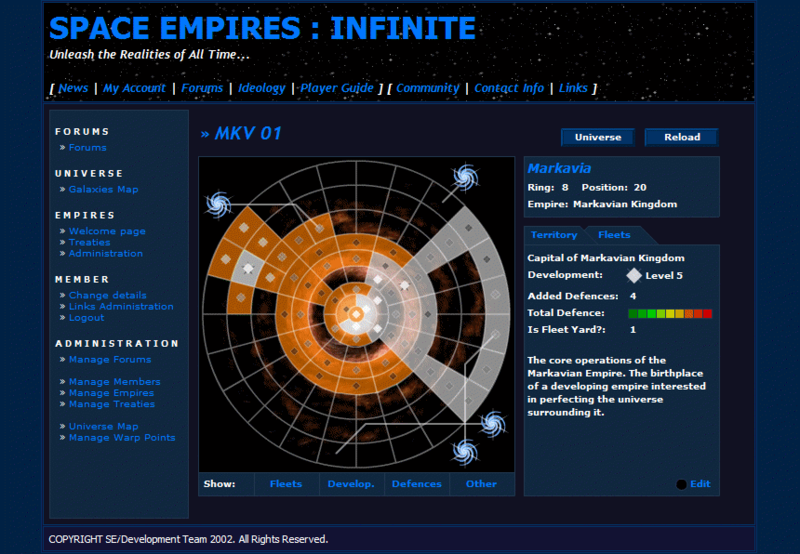 Back in 2005, 2006, I worked hard on a secret community project known as Space Empires: Infinite, or SEi for short. Wasn't really much of a community project since I never got many people invovled, but behind the scenes was a fully operational role play forum and the framework game play system to let players control territory across a network of galaxies. Central to this system was a flash based map of the universe. The map displayed territory for players as a circular ring. Rings in the center of the galaxy represented denser, more habitable, zones, where as areas out on the edge were sparser requiring more time to navigate. Each territority was represented by an entry in a database, tracking development, defence and production values. A description and name for each section could be entered in by the player building up a lively and detailed map of the game universe. Ontop of this, fleets, groups of space ships, could be created and moved between adjacent tiles. The workings of a battle system were put together (but never fully implemented) allowing randomised turn-by-turn attacks to be made on other player territories. The flash map was full database driven, refreshing information between each page. Blue galatic warp points allowed hotlinking between galaxies. Overall, the system was an innovative territory control and gameplay system built on the pattern of online web games that give users daily/weekly control over their empires in order to interact with other players. The site was never finished, but it exists, with a functioning forum and a detailed interactive map for administering the database. Thanks to Theron Williams, Chris Bok, Fyron, and others for early support. I'm only sorry we never saw it through to the end. Such is life.